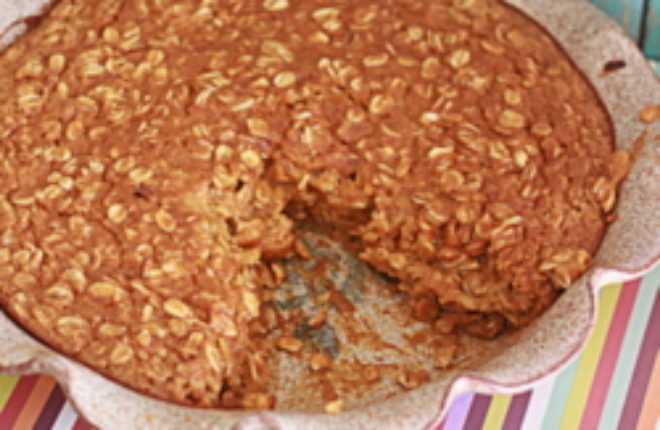 Pumpkin pie and baked oatmeal, together as one. And they lived happily ever after. My poor family. Nearly every morning for the past month, I’ve been plaguing them with some form or another of pumpkin oatmeal. I don’t know why, but I guess I’ve had a little bee in my bonnet. I will perfect some pumpkin oatmeal recipes! I have lofty goals in life. My guy has yet to mutter “pumpkin oatmeal, again?” and for that, I am grateful. He also knows that such a comment might land a spoonful on his head, but I digress. Meanwhile, our little one happily gobbles up spoonful after spoonful, no matter which version I put in front of her. Gotta love that gal. She’s also just a baby who is still at that stage where she’ll pretty much eat anything. I like to tell myself she is extra fond of Pumpkin Pie Baked Oatmeal, though. After all, only two meals – this and The Best Macaroni and Cheese Ever – have elicited excessive “mmmm mmmm” sounds along with her sweet little demand for more (“Mo!”). 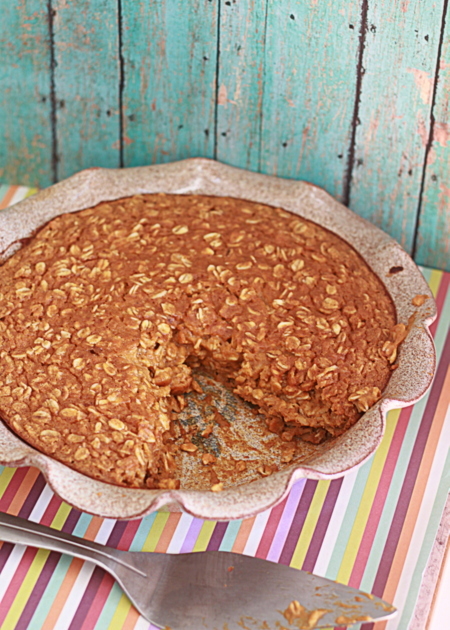 Let’s talk about baked oatmeal for a moment, shall we? It is such a brilliant concept. Fruit, rolled oats, maybe some spices, an egg or two, baked up like a casserole and served like your typical bowl of oatmeal – or, depending on your recipe, like dessert. 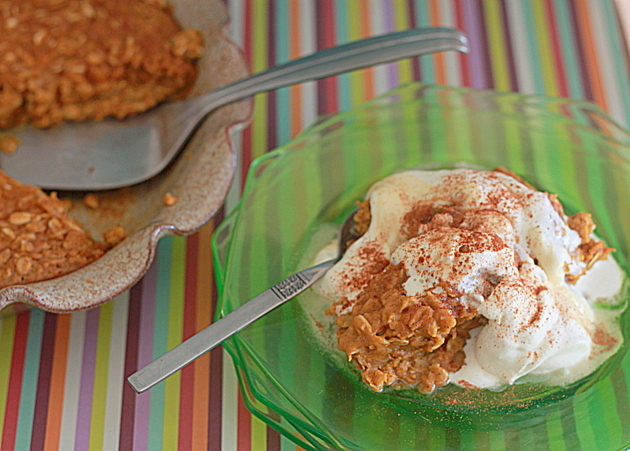 Essentially, I wanted this particular baked oatmeal to taste like pumpkin pie in oatmeal form. It totally works, but it doesn’t go so far down the pumpkin pie path to qualify as dessert, I don’t think – it’s breakfast all the way. Even when you add some lightly whipped cream and pure maple syrup, it’s breakfast. Preheat oven to 375 degrees Fahrenheit. Butter a standard-size pie dish and set aside. In a medium bowl, whisk together the rolled oats, brown sugar, baking powder, salt, cinnamon, nutmeg, cloves, and ginger. In a large bowl, beat the eggs and then add the pumpkin puree, half and half, vanilla, and butter. Mix well. Pour the dry ingredients into the wet ingredients and whisk together until well-blended. Pour the mixture into the pie plate and slightly smooth the top. Bake for about 30 minutes or until the middle is no longer jiggly. Cut into wedges and serve with with pure maple syrup and slightly sweetened, lightly whipped whipping cream. Ha! I have been meaning to work on a pumpkin overnight oatmeal recipe, but maybe I’ll defer to using this one instead. Save my husband all the work on testing my recipe, you know? 😉 This looks like the perfect fall breakfast! Any thoughts on leaving out the brown sugar, and what would happen? Would it be ok, or can something be substituted? 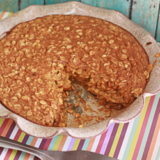 The sugar adds sweetness and richness, making it more “pie”-like – the recipe might taste sort of weirdly savory without the sugar, but you never know, it might be great (let me know if you try it)! I suspect honey would be an excellent substitute (maybe start with three tablespoons or so? ), and I’m sure Splenda or Stevia would work. I don’t generally cook with either of those sweeteners so I’m not sure on quantity. I made this with a couple substitutions because I didn’t have all the ingredients on hand (skim milk instead of half and half, and pumpkin pie spice instead of the cinnamon, nutmeg, cloves, and ginger). I also skipped the maple syrup topping. It was yummy and my kids loved it too! Thanks! Hi Stacy, thank you for sharing! The skim milk substitution sounds like a great way to lighten this one up. Exactly what I was looking for! I made this for my grandson and he loved it… I reduced the sugar a little, and added some unsweetened applesauce,and because i love pecans, I threw in a handful of those and some pumpkin seeds because the dear grandbaby loves those, and it was delicious! We both loved it! Thanks!! Your substitutions sound marvelous! Pecans in particular sound like a terrific addition. Glad you both loved it! Okay, neither patient nor adept enough to make my own pureed pumpkin. May I assume I can use canned pumpkin (not the canned pumpkin pie filling, of course)? Oh, good, because this recipe sounds intriguing. DH & I are owned by 3 cats – I keep telling them I’m going to take them to the kitty orphanage, but they just laugh behind their paws & get into more mischief. Hope I didn’t miss this in a previous post…but wondering if canned pumpkin pie filling(with spices already in it)would be okay…and then not use the above mentioned spices? Hi Sharon, I think that should work. I do believe that pumpkin pie filling is also sweetened, so you may want to to reduce the sugar as well. If you try it, please come back and report how it went! Will certainly let you know, Karen…and yes, cutting back on the sugar makes good sense. Thank you for sharing this recipe!